The city of Florence is surrounded by round and green hills, from where you can generally have a great view. There are many famous destinations in the surroundings that are generally well connected by public transports to the city center. 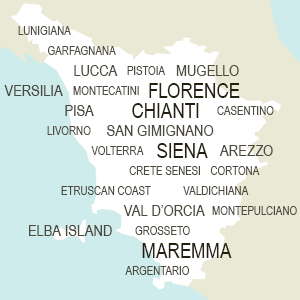 There is Fiesole with its Etruscan origins, Pratolino near Mugello, Settignano and San Donato just to name a few. Florentine hills offer lots of things to see and to do such as small parish churches, Medici's villas, archaeological areas and much more. These 5 country style vacation apartments are set on a family-run vineyard & olive grove in the hills near Florence. Surrounded by the Tuscan landscape close to Florence, it is an ideal base for romantic getaways & family vacations. Positioned in the Tuscan countryside, only 8 km from Florence, Italy, this vacation rental apartment is the ideal setting for up to 6 persons looking for a luxurious setting that speaks of Tuscany & its tradition. On the hills around Florence there are beautiful villas and state buildings. Florentine hills were in the past a desirable place for living close to the city. Take a walk at Pian dei Giullari, Piazzale Michelangelo or in Fiesole and Settignano just to have an idea.